Third-year Occupational Therapy student Abby Morales is one of 12 students selected nationally to receive a scholarship from the Association of Schools of Allied Health Professions. When Morales learned she had received the $1,000 award, she immediately reflected on her faith. "I try to look at things positively and know that God's going to take care of me with school and student loans," she said. 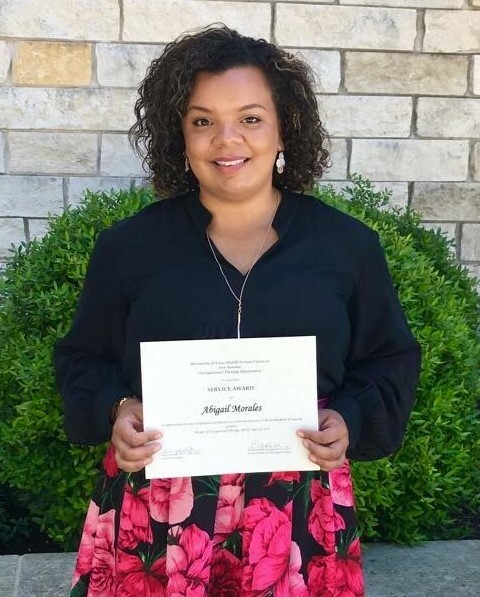 In an email congratulating Morales on the scholarship, Bridgett Piernik-Yoder, Ph.D., OTR, associate professor and chair of the department of occupational therapy, noted that Morales is the first UT Health San Antonio student to receive a scholarship from ASAHP. Morales will graduate in December. She is considering what her future holds in terms of setting and patient populations. She works with children and adults in her current outpatient clinical rotation and has enjoyed pediatrics more than she thought she would. "It's great to be able to see a kid and then an adult," she said. "You are jumping into the pool, out of the pool. It's never boring, and it's super fast paced. It's a lot of fun." Morales' next rotation will be at the VA hospital. "The veterans are really big on my heart," she said. "I have an appreciation for them, and so I would love to give back to them in my career if I have the opportunity to do so later on." Born and raised in San Antonio, Morales initially planned a career as a speech therapist. Then she learned about occupational therapy, which appealed to her because of its focus on rehabilitation in the realm of daily activities. "We are able to help give back meaning to their personal lives," she said. Whether that's bathing themselves or doing yard work or casting out a fishing rod."